WHAT’S in a name? 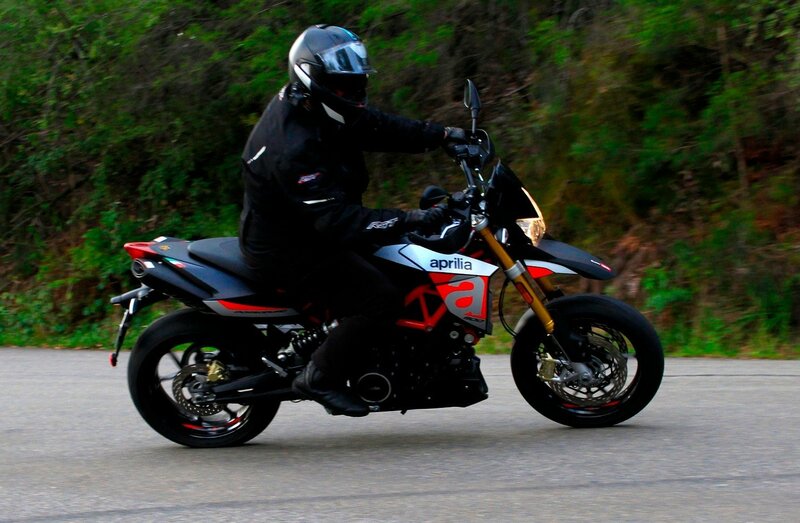 Super Motard, Supermoto, MaxiMotard; all names used over the years to describe one style of bike, with the 2018 Aprilia Dorsoduro 900 representing the new version of a 750 variant that has been around since early 2008. Forget the labels though, they represent things that most riders won’t care about. 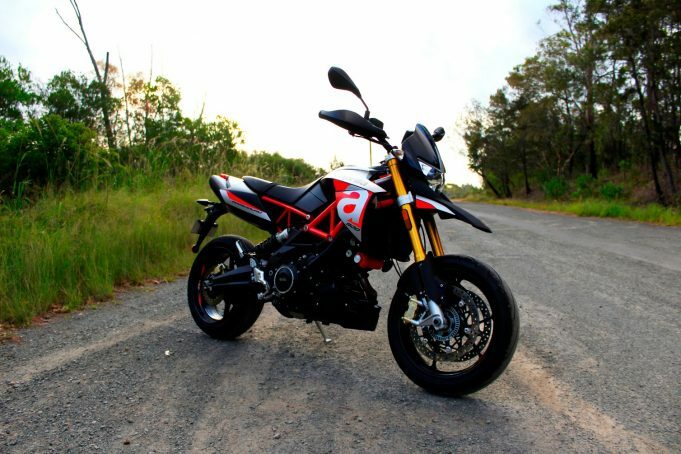 What you get with the 2018 Aprilia Dorsoduro 900 is a hugely fun machine that ticks most of the boxes for your daily ride, is cool, and great fun on weekends. Basically the same platform as the Shiver 900, it comes with a raised up chassis, extended forks and swing arm, and higher Motard style seating and positioning, shorter final drive front sprocket and slightly different engine mapping. The engine is the Aprilia longitudinal 896.1cc 4-stroke 8-valve DOHC V-Twin, and is a redesigned update to the 750, to meet Euro4 emissions compliance, and improve some of the internal workings to make the plant more efficient. The added size comes with a small increase in power and a flattening out of the torque curve, giving the rider access to power more evenly across the rev range, with 70kW of peak power at 6,500rpm and 90Nm peak torque at the same rev point. The styling is consistent with previous Dorso, right down to the beak front end (a Moto requirement, it seems) and the upswept tail, but extra panels have been added around the tank and over the engine, one assumes to make it more accessible for servicing. Oh, and you can have any colour you want as long as it is silver and black, with Aprilia Red highlights and trellis frame. But we have to say, from the gold forks through to the red frame and the black rims, this is an awesome and impressive looking machine. The seat height, at 870mm, puts the rider high, making the bike great in traffic, with visibility into the distance over the top of most cars. It also means the rider can use their body weight to lever the bike around, making it very manoeuvrable. That also makes it just plain fun to throw around tight corners or for power drifting (not that we suggest that is a good idea). The ride position and 905mm handlebars also lends itself to an elbows out stature that is seen on off-road bikes; another moto trait. The front suspension (41mm upside down telescopic forks) has adjustable rebound damping and spring preload, and there’s a rear swing arm offset mounted single shock absorber, with adjustable extension and spring preload. These allow the rider to setup their riding style. 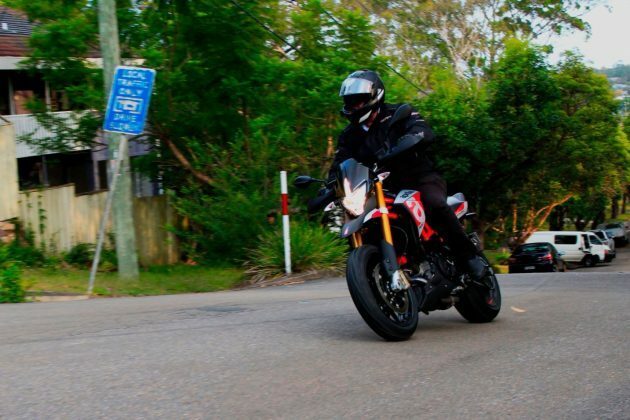 And while the bike weighs in at over 210kg wet, once moving the rider does not notice the weight, and the brakes and suspension are more than up to the task of managing the bike across most surfaces. 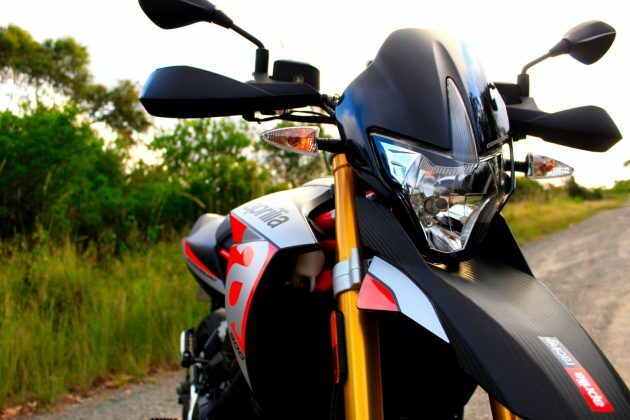 In traffic, the high gearing of the Aprilia tends to make slow travel a clutch and re-clutch affair as you endeavour to putter along below 30km/h, while not accelerating into the cars in front. That said, the Dorso is slightly better at lower speeds than the Shiver though, due to the shorter sprocket on the front. it’s also fitted with a new engine management system based around the Marelli 7SM ECU. The system chats with the new full ride-by-wire electronic accelerator system, completely built into the throttle grip, and uses metrics from the engine, gearbox, air flow, temperature and rider inputs to give excellent control and smoother power delivery. We found this also took any slack out of the throttle, which meant that the slightest bounce in the road or twitch of the hand is reflected in a change of position of the throttle, and a subsequent engine response. The system also provides user selectable mapping options for the engine. Sport; frisky, Touring; more controlled and even, and Rain; which was simply sedate, with around a 25 per cent reduction in power. The Dorsoduro 900 also introduces a new Aprilia traction control system with sensitivity adjustable to three levels (it can also be disabled) to limit rear wheel spin by acting on ignition and the injection throttle valves. For daily riding, setting one and two still allows for a little fun. Setting three is Big Brother. Off removes all responsibility from the bike. Speaking of the bike, it’s got a 12-litre fuel tank, so be prepared to fill up regularly on country trips. You’ll need to top the tank up every 200km or so, and across our ride test we saw around 5.6-litres/100km on the open road, and 6.6-litres/100km in heavy commuter traffic. But you’ll burn that fuel in comfort, because the seating position is fantastic. But there are a few downsides too. The actual seat, designed high, narrow and forward sloping, is great if moving around during active riding or standing on the pegs, but over longer touring type distances, or slow traffic, it feels like a timber bench. The little cowl around the headlight, particularly at cruising speeds, also provided some level of irritation, directing an airflow directly up under the helmet. The headlights are pretty good for halogen, and the indicators and brake lights are bright and obvious. The dash setup is brilliant, with an LCD colour screen and selectable menu options, which are all clear and easily navigated. 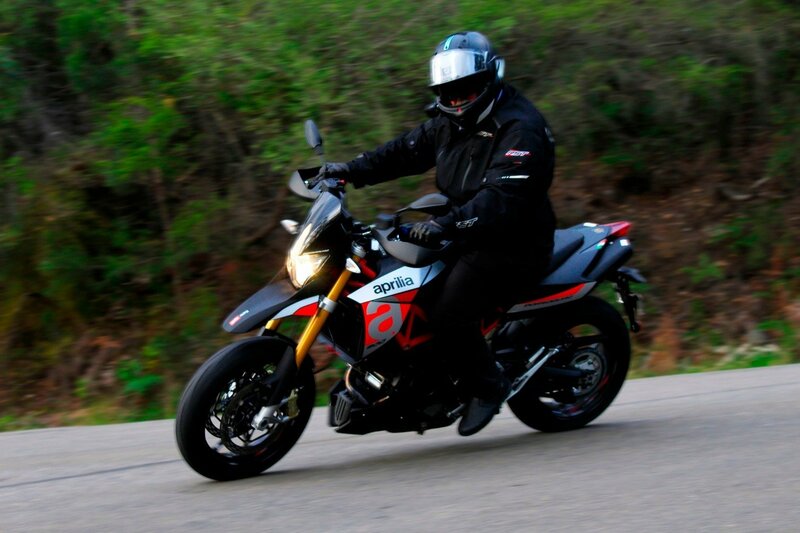 In addition, the Aprilia rider connect package, manages Bluetooth, connectivity, music, and also provides a suite of tools for your smartphone to connect to the bike, letting you record trips and track data; from GPS tracking to lean angles, and speed. There is also a USB port tucked in beside the dash for mounting your smart device. It’s a pretty damn good bike all in all, and while it fits in the Super Motard bracket, we don’t think it will see much time off-road. 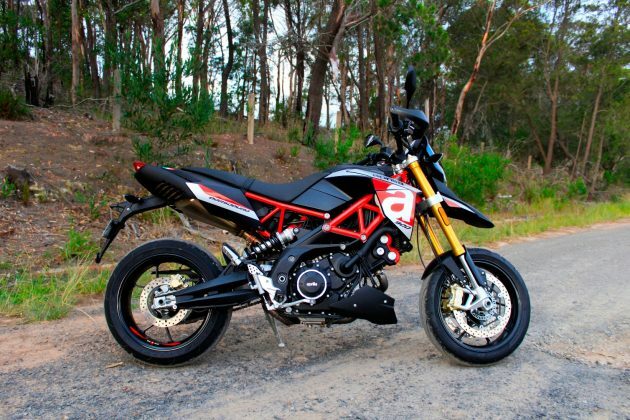 It’s more likely you’ll find the $15,790 (plus on-roads) Dorso exploring urban, paved environs, where it can have lots of sensible fun, up against the likes of the Ducati Hypermotard, a dearer but slightly more powerful option by comparison. Our 2018 Aprilia Dorsoduro 900 was provided by Aprilia Australia. To find out more, contact your Aprilia dealer. Pros - awesome looking bike; performance; really fun to ride. Cons - seat; cowl; low speed gearing. Mark Dobson started riding motorbikes shortly after he got his car licence, some 36 years ago. He's ridden everything from a Kawasaki 350 Triple and a Yamaha SX360, to a Triumph Thunderbird 1600 and an Aprilia Caponord 1200. In all, he's owned 12 bikes and nine cars, and likes to pretend he's a mechanic, a lot. So much so he's helping his son restore a 1994 Toyota Supra. He's a fan of all forms of motor sport, including rally, F1 and MotoGP and he's a little odd, in a good way. He likes the daily commute because he enjoys the sounds of bike and car engines. We warned you he was a little odd.